Hummingbirds are fascinating creatures. Their insanely high metabolisms require them to consume their own weight in nectar every day—meaning at any given moment, they are literally hours away from starvation. They are incredible aerialists, beating their wings between 50 to 200 times each second while flying forwards, backwards, and even upside down at speeds of up to 34 miles per hour. Also, their brains are smaller than a garden-variety pea, which is an important detail in the story I’m about to relate. Let me set the scene for you. We’ve been doing finish work—assembling fans, hanging lights, wiring switches, that kind of thing—on a custom home for the past few days. Business as usual. I was the first one on the job site this morning, so I fished the garage door opener out of its super-secret hiding place and hit the button. I had just taken my first step inside when an unexpected noise froze me in my tracks. I looked over my shoulder at the driveway just to make sure I hadn’t miscounted. Nope. Zero other cars. I was the only one here—so either the noise was all in my head or there was a rabid mongoose upstairs, just waiting for its moment. Oh well. Occupational hazard. I continued gathering up the materials I needed for the day’s work, and as I passed through the garage a second time, I heard the noise again—and there, in the corner of the room, was a hummingbird, desperately mashing his face against a window pane. 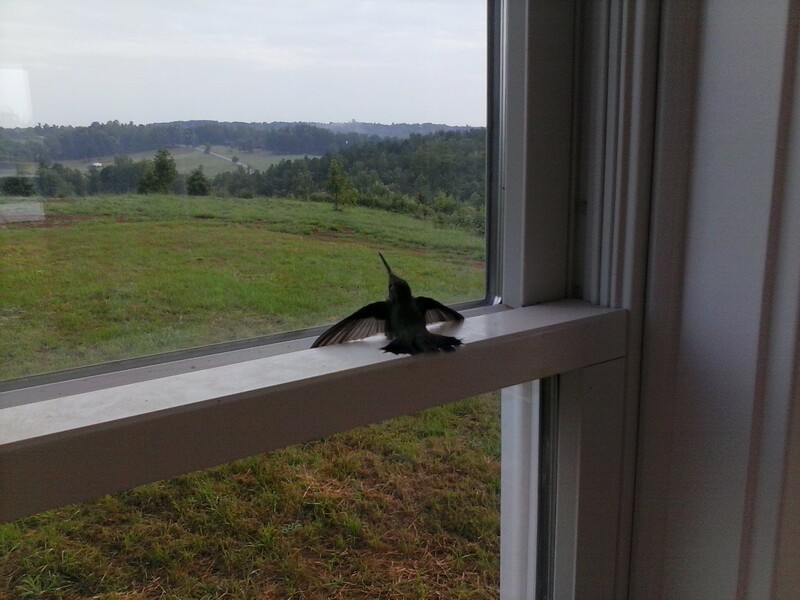 I watched bemused for a couple minutes while he fluttered from pane to pane on the top half of the window, frantically pecking each one in a bid to find some weakness in the magical force field which had entrapped him. It never worked, but that didn’t stop him from doing it again…and again…and again. I decided to leave him alone for a couple minutes. Surely he would eventually turn around and notice the two gaping garage doors were wide open. Minutes passed, but he never strayed from those four window panes, hammering away with a determination which would have been laudable if it weren’t so misguided. By now the poor bird had worn himself out to the point that, every thirty seconds or so, he would plop down on the ledge to catch his breath before giving it another go. Nothing. 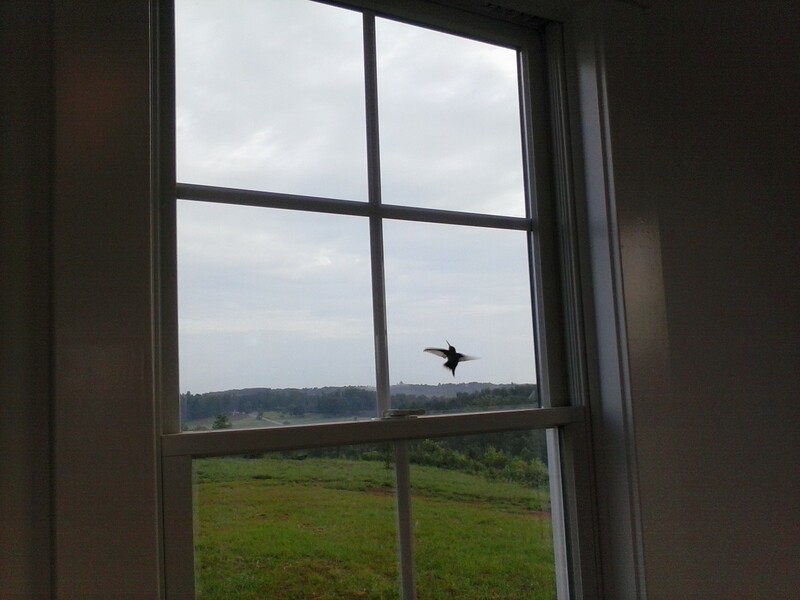 I had given the hummingbird no fewer than three obvious escape routes, all of which had escaped his attention. The little guy was going to die pecking at this window unless I found a way to coerce him outside. Fine, I thought. We’ll do this your way. 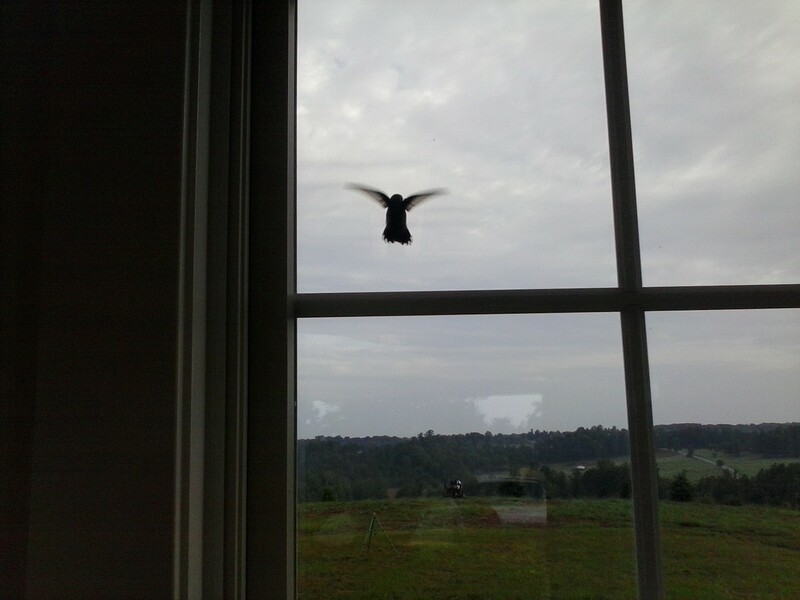 Walking around to the other side of the window, I scooted the top half down…and off he flew. Right. I’m the hummingbird, aren’t I? How often do I make things harder on myself by not paying enough attention? How often am I convinced in my little pea-sized brain that I know how things need to turn out? How often do I find myself stuck somewhere, pounding my head against the window and begging for divine intervention, all while God is standing behind me and gesturing toward the open garage door? Too often, I’m sure. We’re human. We get tunnel vision. We think it’s our job to save ourselves, when so often we forget what Moses told the Israelites when they stood “trapped” at the edge of the Red Sea: “Stand still, and see the salvation of the Lord, which He will accomplish for you today… The Lord will fight for you, and you shall hold your peace” (Exodus 14:13-14). When Israel saw no way out, God parted the waters like a curtain. That makes my trick with the garage door opener a little less impressive, but the principle is the same: with any trial, temptation, or difficulty, “God is faithful, who will not allow you to be tempted beyond what you are able, but with the temptation will also make the way of escape, that you may be able to bear it” (I Corinthians 10:13). God will open the right doors at the right time—we just have to make sure we’re paying attention. 6 Responses to "A World of Panes"
It is good to reflect upon the theme you wrote. Thanks. Thank you Jeremy. What a wonderful lesson and superbly told. I needed to hear it at the very moment. I praise The Almighty and Awesome God for your post. Thank you. I see myself here so clearly. So helpful & thought provoking. Thank you so much.